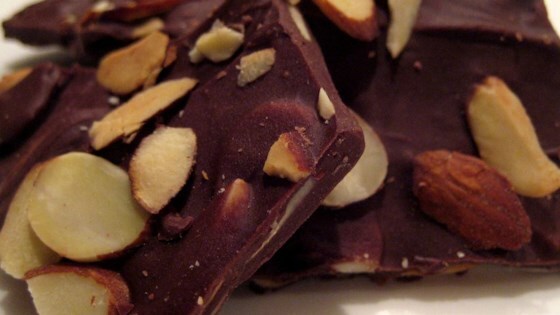 "Chocolate lovers and sweet tooths alike will enjoy this chocolate-almond confection!" Line a 9x13 inch baking pan with parchment paper. Set aside. Put chopped almonds In a skillet. Cook, stirring often over medium high heat, until golden brown. Remove from heat. In a metal bowl over a pan of simmering water, melt chocolate chips and shortening until smooth. Remove from heat and stir in 1/2 the toasted almonds. Spread onto the prepared baking pan. Sprinkle with remaining almonds, and chill 30 minutes, or until solid. Break into bite-size pieces to serve. See how to make a festive holiday treat, chocolate bark. Did not come out for me at all. this recipe is not complete. what to do with the other 1/4 cup almonds? Yummy! I make mine with dark chocolate - PC semi-sweet chocolate chips are best. The shortening is a must to get the chocolate to melt right. I would leave out the shortening next time. The shortening makes the chocolate stay soft. The flavors are delicious but next time I will use whole or chopped almonds instead of sliced.